Sad to see one of my favorite Lakers leave. Last season was not only a nightmare for the team but for Pau. With horrible coaching and injuries Pau's season wasn't reflective of his abilities. From the addition of Dwight Howard to his free agency he was thoroughly disrespected and misused as a player. Constant trade rumors and diminished playing time surely played a part in messing with the mental aspects of his game. As he embarks on to Chicago it will be proven Pau will be a free agent steal of the summer. 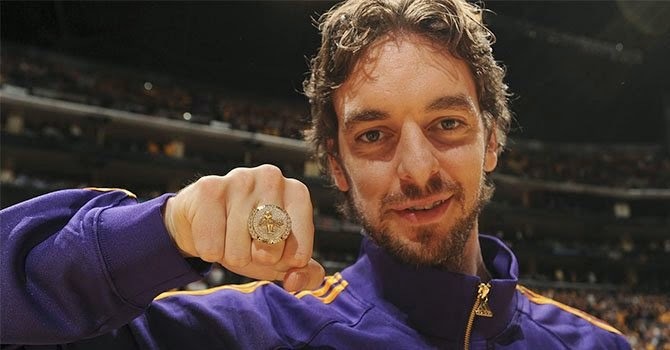 Pau will rank as one of my favorite Lakers but favorite players. This is a funny commercial. Playoffs are coming. Peace. Tony Wroten Nike Jordans fail! Jordans are are cool shoes. This might make you think different. Why Im selling mine off. Anyone wear size 14? Lakers Score 51 Points in the 3rd Quarter! Why couldn't they do this all year? What a game. Lakers win.Go Lakers!! 2013 NVROMEDIA ALL RIGHTS RESERVED. Powered by Blogger.